Two challenges in one in this post! I'm carrying on with #BEDM but writing about The Year in Books, to keep myself up to date! Linking up with Laura my book for May is Forbidden by Tabitha Suzuma. I came across Jocelyn's blog and her desire to #BringBackPaper (a brilliant idea!). In April, she arranged a swap between readers - the idea being you send a book, any book, to another reader, and you get a book in return. The book I received was Forbidden. Admittedly, it's not a book I would have chosen myself (it's YA fiction, which is something I only read if highly recommended) but having read the blurb and the first few pages, I'm actually enjoying it so far, so I'm pleased my horizons have been broadened. April was a varied month for reading. Double Fault by Lionel Shriver was absolutely excellent. I loved We Need To Talk About Kevin and The Post-Birthday World and I'm pleased with how much I enjoyed this earlier book of hers, published in 1997. It's about Willy, a female pro-tennis player, working her way up the rankings; she meets Eric, who is also working his way up the tennis rankings, and the book follows them over a number of years as their career and relationship develop. I have very little interest in tennis, and even less interest in snooker which is the sport played in The Post-Birthday World, but that didn't really matter. A lot of the sport-specific vocabulary is either explained, or becomes clear through the context in which it is used. Overall, a jolly good book indeed, I'm always reassured when a book by an author I like meets my expectations. I started In a Fishbone Church by Catherine Chidgey but just could not get into it, so I only managed a few pages before giving up. 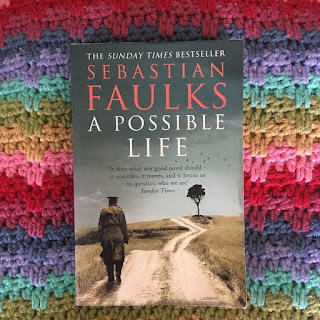 I'd been given The Shock of the Fall by Nathan Filer from my mum, who had read it for her book group - as it's a book I've been wanting to read for a while (it seems as though everyone has been reading it!) that might have influenced my lack of patience with In a Fishbone Church. The Shock of the Fall was very good indeed. A very quick read, it follows the story of Matthew and his brother Simon. It raises interesting discussion points about grief and mental illness. I also liked the occasional illustration, and the different fonts used for different sections. I borrowed my Mum's copy, as she was reading it for her book group, and she reported back that everyone at the book group had a) finished the book and b) enjoyed it. Apparently this is only the second time that's happened, the first time was The Kite Runner several years ago. My book for April was The Ides of April by Lindsey Davis. I won a copy from Goodreads and I was looking forward to it as I had heard good things about her previous detective novels. However, this book didn't do anything for me, I found it hard to get into and I had no empathy towards any of the characters. The dialogue was a bit off-putting and I wasn't very interested in how the plot developed. I'm planning on reading one of her earlier books, as from the reviews I've read, several people have said her earlier books are better than this one. Another varied month, and I think May will be too! I'm sometimes a bit wary with reading a book people have been raving about online, as I want to enjoy it as much as they clearly did, but I have been let down in the past! So pleased this one was as good as I expected, though. Another person who enjoyed The Shock of the Fall, I think everybody who has read it has liked it! I am a bit inconsistent with historic fiction...I enjoy some (mainly Philippa Gregory) but I think a book set during the height of the Romans is a bit too historic for my taste! I've never heard of The Shock of the Fall, but seeing as so many people are enjoying it, I'll have to check it out! Yes, do check it out...highly recommended by many many people! Yes, definitely add it to the reading list! Oh I'm glad you like The Shock of the Fall. My book group had the same reaction as your mother's.